This article is a brief introduction about User Datagram Protocol (UDP) and Transmission Control Protocol (TCP) in relation with Ozeki VoIP SIP SDK. It describes all you need to know about these basic network communication protocols and their implementation. TCP stands for Transmission Control Protocol. TCP is a connection-oriented protocol that is responsible for reliable communication between two end processes. The unit of data transferred is called a stream, which is simply a sequence of bytes. TCP is one of the main protocols in TCP/IP networks. Whereas the IP protocol deals only with packets, TCP enables two hosts to establish a connection and exchange streams of data. Being connection-oriented means that before actually transmitting data, you must open the connection between the two end points. The data can be transferred in full duplex mode (send and receive on a single connection). When the transfer is done, you have to close the connection to free system resources. Both ends know when the session is opened (begin) and closed (end). UDP is the short term for User Datagram Protocol, a connectionless protocol that, like TCP, runs on top of IP networks. By using UDP, programs running on different computers on a network can send short messages known as Datagrams to one another. UDP is a stateless protocol that is useful for servers engaged in answering short queries from a large number of clients. While TCP is mainly used for communication between a server and a single client, UDP is used for packet broadcast or multi-casting whereby the data is sent to all the clients in the network. Frequent network applications that use UDP include: Trivial File Transfer Protocol (TFTP) , Voice over IP (VoIP), IPTV, Domain Name System (DNS), etc. 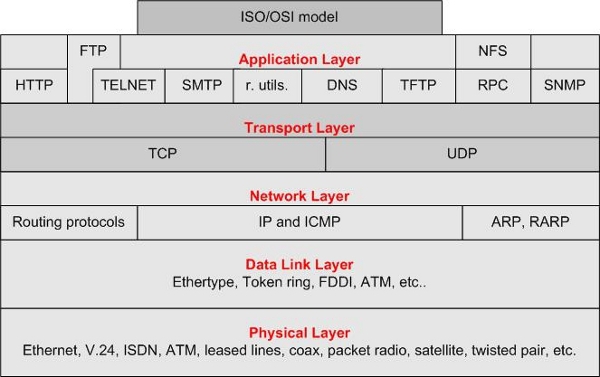 The Data Link Layer implementing Wi-Fi, ISDN, GPRS etc. Transport Layer implementing TCP, UDP, etc. Application Layer running DNS, FTP, HTTP, POP3, SMTP, Telnet, etc. Ozeki VoIP SIP SDK provides a great background support for all the technologies and functionalities that are mentioned above in this article. If you want to create a VoIP solution that has all this support, you only need to download, install and use Ozeki VoIP SIP SDK. After reading this article, by now you can be fully familiar with the theoretical background of UDP and TCP protocols. If you have read through this page carefully and checked the provided examples on the implementation, you already have all the knowledge you need to start on your own solution.